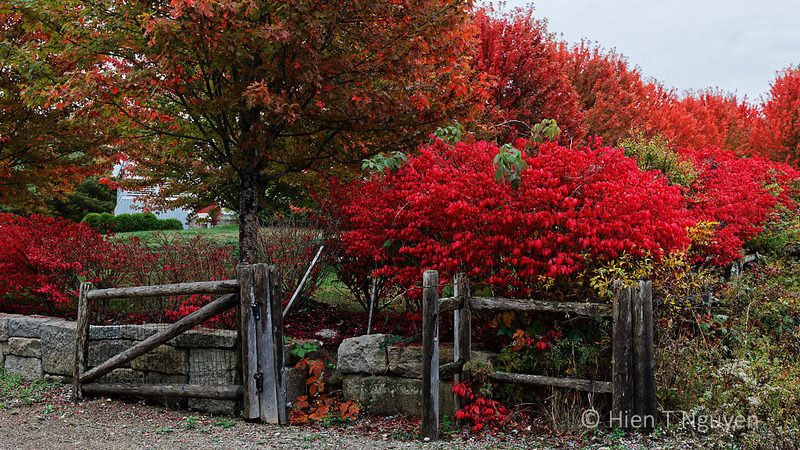 I like that fence with the bright red shrub behind it. 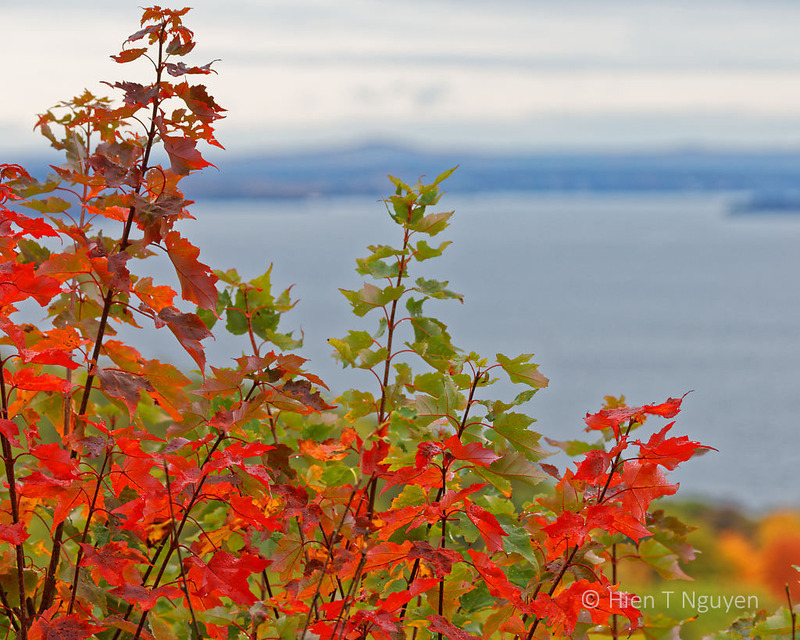 It looks like you enjoyed some beautiful color in Maine. 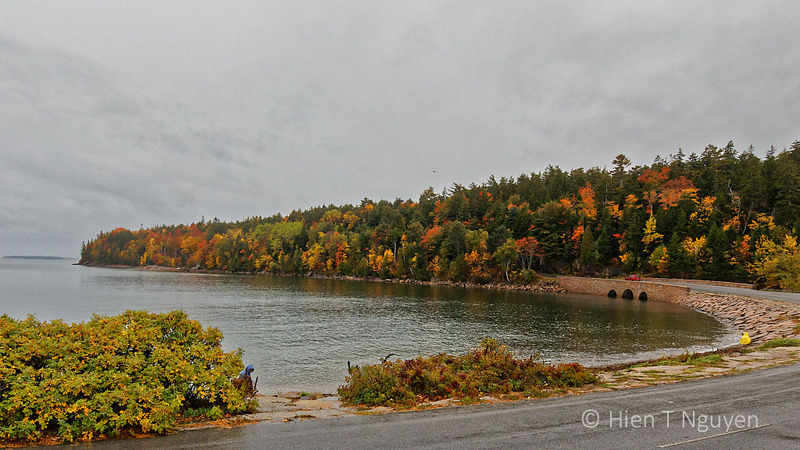 The beautiful Maine autumn colors managed to compensate for the rainy weather during the four days I was there. I can only imagine what they could be when it is sunny and dry. Such colorful splendor you’ve shared, thank you very much! Gorgeous colors!! I enjoy them a lot because we don’t get those here in ‘evergreen’ Florida. So much autumn beauty – I’d say you timed your trip perfectly! You are right about the timing. I read up on New England fall colors and just followed the recommendations. I think that the scenery and lighting along with your composition would make for good images of these locations any time of the year, but in the fall, they’re stunning! I particularly liked the first one that you titled “In Acadia National Park”. Thank you Jerry! For that one that you like particularly, I saw people stopping their cars and get out to photograph the scene, even though it was raining! Such beautifully serene scenes, Hien! Glad you like them, Dries! Nice colors! Just got back from visiting the Smoky Mountain NP. Colors aren’t at peak and I’m told they won’t be very good this year due to the warm weather late in the season. If the warm weather extends too long, followed by freezing weather, fall colors may indeed be dull. We shall see. The trees around me are just beginning to turn, and so far the colors are muted. I just finished tomorrow’s Cellpic Sunday post scheduled to publish tomorrow. It’s a shot taken last Monday in the park. 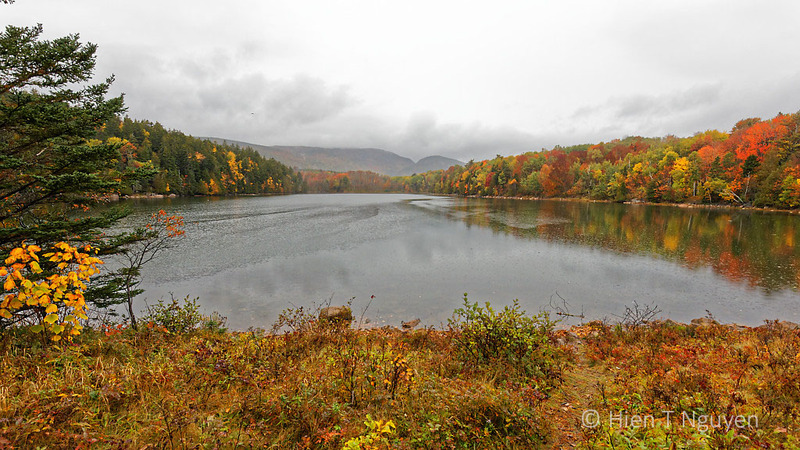 It is indicative of the muted colors that were in the park last week. Fall colors will migrate down to Memphis, and you will be able to enjoy them there also. Just gorgeous -I really need to get to Maine and the whole of New England someday! You will like it, when you visit the region! Beautiful, Indeed! We were there over 3 weeks ago, it just started changing colors. You probably missed peak colors by a week. Thanks Amy! Such beauty. I just got through driving from SO CA, to Spokane, WA and got excited just driving through small stands of yellow trees. To be surrounded by so much fall follage looks exquisite! This was fall colors at their peak in Maine. It’s still very green around my home. The entrance near the harbor, especially, is beautiful. Have you been to Maine in the summer, Hien? I so want to go there. This was the first time I visited Maine. A visit in the summer sounds like an excellent idea.